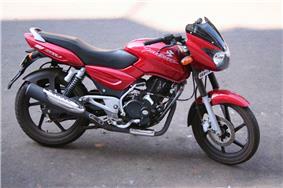 Bajaj Auto Limited is an Indian two-wheeler and three-wheeler manufacturing company. Bajaj Auto manufactures and sells motorcycles, scooters and auto rickshaws. Bajaj Auto is a part of the Bajaj Group. It was founded by Jamnalal Bajaj in Rajasthan in the 1930s. It is based in Pune, Mumbai, with plants in Chakan (Pune), Waluj (near Aurangabad) and Pantnagar in Uttarakhand. The oldest plant at Akurdi (Pune) now houses the R&D centre 'Ahead'. Bajaj Auto is the world's sixth-largest manufacturer of motorcycles and the fourth-largest in India. It is the world’s largest three-wheeler manufacturer. On 31 March 2013, its market capitalisation was INR 520 billion (US$9.57 billion), making it India's 23rd largest publicly traded company by market value. The Forbes Global 2000 list for the year 2012 ranked Bajaj Auto at 1,416. 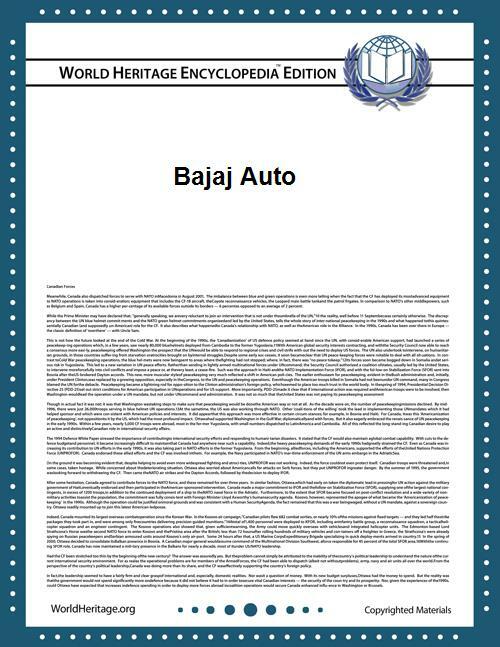 Bajaj Auto came into existence on 29 November 1945 as M/s Bachraj Trading Corporation Private Limited. It started off by selling imported two- and three-wheelers in India. In 1959, it obtained a licence from the Government of India to manufacture two-wheelers and three-wheelers and it became a public limited company in 1960. In 1970, it rolled out its 100,000th vehicle. In 1977, it sold 100,000 vehicles in a financial year. In 1985, it started producing at Waluj near Aurangabad. In 1986, it sold 500,000 vehicles in a financial year. In 1995, it rolled out its ten millionth vehicle and produced and sold one million vehicles in a year. According to the authors of Globality: Competing with Everyone from Everywhere for Everything, Bajaj has operations in 50 countries by creating a line of bikes targeted to the preferences of entry-level buyers. Motorcycles in production are the Platina, Discover, Pulsar and Avenger. Bajaj also distributes motorcycles in India for other manufacturers, such as the Kawasaki Ninja 250R, the Ninja 650R and new for 2012, the KTM Duke 200. Tempo Firodia: Bajaj Auto bought a controlling stake in the Tempo Firodia company, renaming it "Bajaj Tempo". Germany's Daimler-Benz, a long-time collaborator with Firodia because of their ownership of the original Tempo works in Germany, owned 16% of Bajaj Tempo. Daimler sold their stake back to the Firodia group in 2001, meaning that they once again held a controlling interest, with BAL retaining 24% of the shares. It was agreed that Bajaj Tempo would gradually phase out the use of the "Tempo" brand name, as it still belonged to Mercedes-Benz. The name of the company was changed to Force Motors in May 2005, dropping "Bajaj" as well as "Tempo", over the objections of Bajaj Auto with whom the company shares a long history as well as a compound wall. KTM Power Sports AG: In November 2007, Bajaj Auto acquired 14.5% stake in KTM Power Sports AG (holding company of KTM Sportmotorcycles AG). The two companies have signed a cooperation deal, by which KTM will provide the know-how for joint development of the water-cooled four-stroke 125 and 250 cc engines, and Bajaj will take over the distribution of KTM products in India and some other Southeast Asian nations. As on 31 March 2013, Bajaj Auto held 47.96% stake in the company. Listing: Bajaj Auto's equity shares are listed on Bombay Stock Exchange where it is a constituent of the BSE SENSEX index, and the National Stock Exchange of India where it is a constituent of the CNX Nifty. : On 30 Sep 2015, 49.29% of the equity shares of the company were owned by the promoters Bajaj Group and the remaining were owned by others. Bajaj Auto had a total of 8,036 employees as of 31 March 2013, of which 51 were women (0.63%) and 25 were differently-abled (0.31%). It spent INR 6.5 billion on employee benefit expenses during the FY 2012-13. The company is headed by Rahul Bajaj whose net worth was around US$2 billion in March 2013. ^ a b c d e f g h i j k l "Annual Report 2012-13" (PDF). Bajaj Auto Limited. 19 July 2013. Retrieved 27 October 2013. ^ "Company Profile - Bajaj Auto". IndiaInfoline. Retrieved 27 October 2013. ^ a b c "Achievements 1945-1959". Bajaj Auto. Retrieved 27 October 2013. ^ a b c d e "Achievements 1960-1991". Bajaj Auto. Retrieved 27 October 2013. ^ "Achievements 1992-2009". Bajaj Auto. Retrieved 27 October 2013. ^ Sirkin, Harold L; James W. Hemerling, and Arindam K. Bhattacharya (11 June 2008). GLOBALITY: Competing with Everyone from Everywhere for Everything. New York: Business Plus, 304. ISBN 0-446-17829-2. ^ "Kawasaki Ninja 250R | Kawasaki Ninja Bike | Sports Bike | Probiking | 250cc Sports Bike | Bajaj Auto India". Bajajauto.com. Archived from the original on 3 February 2011. Retrieved 28 January 2011. 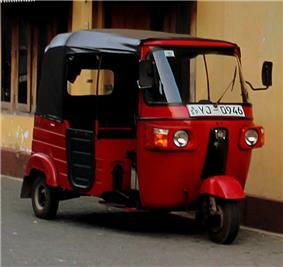 ^ "Bajaj small car may cost Rs 1.1 lakh – News – Zigwheels". Timesofindia.zigwheels.com. Retrieved 24 November 2010. ^ Srinivasan, Lalitha (24 September 1999). "Bajaj gets into the Spirit". Mumbai: Indian Express Newspapers (Bombay) Ltd. Retrieved 13 April 2012. ^ "Bajaj auto launch new Discover 125". The Hindu. 14 May 2012. Retrieved 8 July 2013. ^ "Bajaj Auto Launches Discover 150F, 150S". ^ "Bajaj Tempo will now be Force Motors". The Times of India (Bennett, Coleman & Co. Ltd.). 24 February 2005. Retrieved 20 September 2013. ^ "It's official: Bajaj Tempo is now Force Motors". The Economic Times (Bennett, Coleman & Co. Ltd.). 12 May 2005. Retrieved 20 September 2013. ^ "Bajaj Auto takes 14.5% stake in KTM Sports". business-standard.com. 5 November 2007. Retrieved 3 December 2007. ^ "Demerger News". Bajaj Auto. Retrieved 27 October 2013. ^ "Business Responsibility Report 2012-13" (PDF). Bajaj Auto. Retrieved 27 October 2013. ^ "Awards and accolades 2010-2011". Bajaj Auto. Retrieved 27 October 2013. ^ "Awards and accolades 2007-2008". Bajaj Auto. Retrieved 27 October 2013. ^ "Awards and accolades 2005-2006". Bajaj Auto. Retrieved 27 October 2013. ^ "Awards and accolades 2003-2004". Bajaj Auto. Retrieved 27 October 2013. ^ "Awards and accolades 2002-2003". Bajaj Auto. Retrieved 27 October 2013.